All India Management Association (AIMA) conducts MAT exam for MBA admission four times in a year. AIMA opened the MAT May 2019 Registration on March 7, 2019 and has allowed more than one and half months for MAT exam May 2019 registration. MAT May 2019 exam date is Sunday May 5 as paper based test and May 18, 2019 as computer based test. While the MAT May 2019 Registration Last Dates for different modes of MAT exams are different, the result date for all the three exams is same. The Paper based May MAT 2019 exam time and duration is from 10 AM to 12.30 PM while the computer based MAT exam is scheduled in different time slots. You cannot go for offline MAT Exam Registration 2019. It is very much important to complete the MAT 2019 Registration before the MAT May 2019 Registration Last Date. The MAT registration fee includes GST also. AIMA may also allow the candidates to go for MAT exam 2019 registration for all the three MAT exams instead of earlier two as the exam dates are different but the process has to be completed by the MAT Registration 2019 Last Date by paying requisite MAT registration fee. AIMA earlier allowed to submit the MAT Registration & application offline in hard copy. However, the process has been discontinued now. AIMA earlier also allowed to purchase MAT Registration & application forms. The facility to buy MAT 2019 registration forms is withdrawn now. Earlier you could obtain MAT registration Form with MAT Bulletin/CD against cash payment of Rs.1,550/-(Inclusive of GST) for one MAT or Rs.2650/- for both the MAT exams from listed Study Centres of AIMA or from AIMA, New Delhi. Earlier, the candidates could also buy the MAT exam registration forms from the designated AIMA Nodal centres across India. However, this facility stands withdrawn now. If at all, the facility to buy MAT Registration forms is re-opened by AIMA, the last date for submitting the MAT offline form will also be the same. 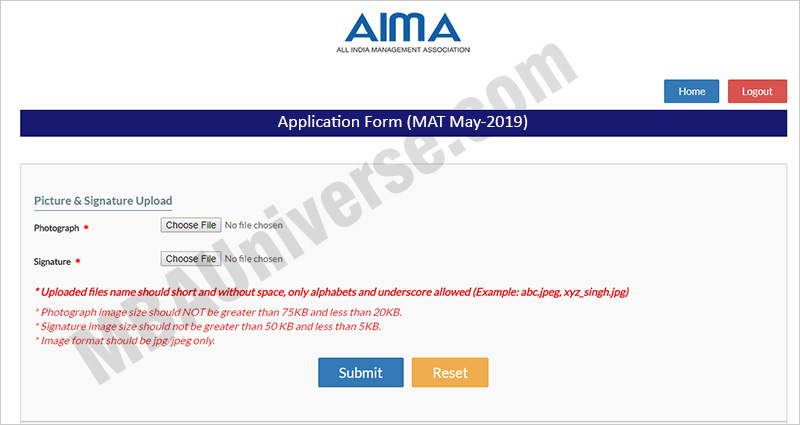 New candidates going for MAT 2019 registration need to visit AIMA MAT website and click on New Candidate to Create Log in. You have to fill the details to create Login. You must have a valid email ID for applying online. Press the button “Submit”. Once you fill the information in the form, it will not be changed. The confirmation for the MAT Exam Registration 2019 will also be sent on your email as entered in the form. Please note that the Email-ID and Date of birth as filled by you will be used to login to the website to fill the MAT 2019 online registration. Once you receive the MAT exam 2019 registration number, you need to login as already registered candidate. You should now login with the registered id, complete the MAT on-line registration and application form, upload the scanned photograph and signature and make payment. Fill the details on the MAT online registration form. Since your MAT eligibility is screened based on the information furnished by you, you are required to exercise care to correctly furnish the details of your Qualification, etc. While filling the MAT 2019 registration form online, please save the information by clicking the Button “SAVE”. In case you wish to edit any information you can do that by login again using Email‐ID and Date of birth and after editing the information, make sure to save the information by clicking The button “SAVE”. Photograph must be a recent passport size colour picture. Make sure that the picture is in colour, taken against a light‐coloured, preferably white background, and has no harsh shadows. Ensure that both ears are visible in the picture. Caps, hats and dark glasses are not acceptable. Religious headwear is allowed but it must not cover your face. The image should only be in .jpg or .jpeg format. Size of file should be not be more than 75 kb and not less than 20kb. Sign on white paper with Black ink pen and scan it. Ensure that the size of the scanned image is not more than 50 kb. If the signature image does not match the signature on the answer sheet at the time the written test and at the time of Interview, the candidature will be cancelled. Payment of MAT exam fee can be made through online Mode only. Accordingly, to make payment of MAT exam fee for Rs.1550/- or Rs.2650/- (As may be the case) you should keep your Debit/Credit Card/Net Banking in operational condition. Your MAT application is complete now. You can view the application details by clicking the button ‘View Application’ and can take print out of the same for your record. Debit / Credit Card/Net Banking details while making online payment.